Began the day with breakfast at Harpoon Harry's, part of our Sunday routine now. We had dinner last night at Salsa Loca, the first time we've been there for a couple of months. These two places are among a relatively small number of places we like to go regularly, some of which I've written about here. We're about halfway through a card of ten restaurants that entitles us to one free entree with the purchase of another at full price. We used it, among other places, to eat at Latitudes on Sunset Key on our anniversary this year. Now I'm in the gallery for the day, while Janet goes shopping for a variety of things for us and for Peter's houses. I realize that we've never really told the story here of what happened to us after Captain Outrageous' untimely and unfortunate passing. Long story short, after helping his girl friend Sherry and his attorney to sort things out between his business and personal assets, we wound up managing the properties that Captain was managing for their absentee owner. There are four houses in all, some of them rented, and all of those to working men who choose to live at this level of the affordable housing market. Jesse Watlin of Key West. Neither of us have any experience operating an art gallery, so we're feeling our way into it very cautiously. Our major focus during the months since Captain died have been mostly focused on taking care of building maintenance and the tenants who occupy the properties. The property management gig has been a wild ride at times. We had to deal with a number of cases of unworthy tenants and unreliable workers, those who couldn't live up to the very simple standard we set for all tenants and workmen, the Golden Rule, do unto others what you would have them do unto you. Those who couldn't are now gone, and we've almost landed at tranquility base. We found a reliable handyman, as well as a resident caretaker for the houses that are across Old Town from here. Once taxes are paid at the end of this month, we'll be able to focus once again on our mission to finish the maintenance work and to make some improvements that will enhance the value of the properties. I have photos of all of the art at our photo site if you' care to peruse the collection. The trip to Massachusetts for my 50th high school reunion took eight full days, including four days on Amtrak between Miami and Boston. We also got to spend some time with our daughter and grandkids in New Hampshire, and to see my Mom at the nursing home she's at in Mass. It has taken most of the time since then to get caught back up on things here. That isn't an excuse for not posting here, but it is a part of the explanantion. 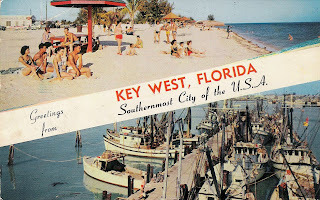 While we were gone -- in fact, on the day we were returning -- the good citizens of Key West approved a referendum question on the ballot that gives the City direction to negotiate a 99-year lease with the Bahama Conch Community Land Trust on a portion of the Truman Waterfront to develop what is being called, for now, Bahama Conch Village. I remain, to the best of my ability, involved in the community, attending Commission meetings and some of the other boards. Developers are rampant now and they are changing the City. Hampton Inn, where I stayed with my brother in 1998, the first time I came to modern* Key West, is being converted to condominium ownership, each of which will have a transient rental license and which will probably be purchased by an investor rather than by a full-time resident, as a place to live and to be a part of The Real Key West. At the same time, Parrot Key's developer, Pritam Singh (of Truman Annex fame), is hawking the excess of transient licenses from Parrot Key for around $30,000 each. He has nine aimed at permanent living units on Simonton and Dey Streets, close to here. They are owned by one of Ed Swift's (Historic Tours of America, champion of "affordable" housing) companies. It was laughable at the Planning Board hearing on the transfers, last Thursday, to hear Singh claim to represent both himself as "sender" of the licenses, and Swift as "receiver" of the licenses. When asked anything about the receiver sites, he merely shrugged and said he didn't know. The Planning Board made no decision, tabling the requested transfer to a subsequent meeting. Transient licenses ought to be retired rather than transferred when no longer needed but, since there's a property right attached to them, another scheme, such as purchasing them back and retiring them might be found. Sloan Bashinsky writes about it at Good Morning Key West. Tom Milone takes the lead in the effort to halt the transfers into Old Town. I know that this is a somewhat disjointed posting. I'm trying to make up for lost time. I'll try to do better in the future. My husband and I were in your gallery last week and loved Jesse Watlin's art. As you suggested, we went to Mallory Square at sunset and bought a small piece from him. We are still interested in one of the larger pieces from the Real Key West Gallery, but can not find out how to contact the Gallery. (Jesse gave us the telephone number, but I misplaced it). If you could post the web site for the gallery or a telephone number on your next blog, I would love to have you ship the piece.